An addition to the snowdrop literature? 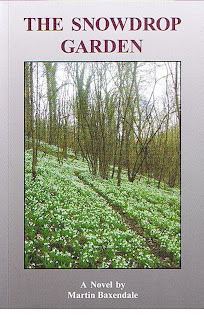 "The Snowdrop Garden" is Martin Baxendale's first novel, a romantic comedy set in the enchanting, eccentric and increasingly fashionable world of snowdrop growers and collectors where (much like the crazy days of the Tulip Fever in 17th century Holland) enthusiasts will pay mad money at auction (up to GBP 200- GBP 300) for a single bulb of the latest and most desirable varieties to add to the hundreds of different snowdrops already in their collections. Some call it the White Fever; that time in January-February every year when keen snowdrop growers visit each other's gardens to compare collections, gather at special Snowdrop Lunches and Galas to admire new forms and varieties and spend silly amounts to outbid each other for the latest white-flowered novelties.One of England's biggest and most beautiful woodland snowdrop gardens faces the builder's bulldozers as elderly Lady Cherington is forced to sell up to settle her massive debts. Can young Ben, another keen snowdrop collector, help save Lady C's family home, garden and unique collection? Does his feisty new Slovak environmental-warrior wife, Katka, with her Eastern European connections, hold the answer to all their problems? Or is it her fault there are Bulgarian gangsters with big guns in the shrubbery, trampling on Lady C's favourite snowdrops? Why are there Russians with even bigger guns in the front drive? Why do they all want Lady C's smelly old husband, The Colonel? Will Katka's twins be born in hospital or an armoured personnel carrier amongst the snowdrops on Lady C's lawn, and where did Katka learn to drive an armoured car anyway? Martin Baxendale has been a cartoonist and writer for the last 25 years. His father is the cartoonist Leo Baxendale, famous for creating 'The Bash Street Kids' and other popular strips in 'The Beano' in the 1950s and 60s. The Snowdrop Garden is his first novel. Having now read this highly improbable-seeming book, what to make of it? It is certainly a curiosity. 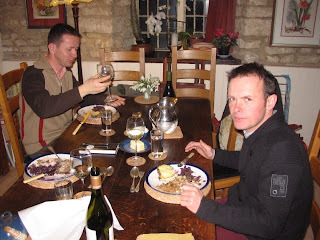 Despite the usual disclaimer about coincidental similarities, one feels it must be heavily autobiographical of either fact or fantasy, with heavy details of Slovakian cuisine and lingistics that could not be dreamt-up, for example. Into the fantasy mix are dropped some fairly substantial chunks of galanthophilia, including references to the paper "The Systematic Value of Nuclear DNA content in Galanthus by B.M.J. Zonneveld" (actually B.J.M Zonneveld, with co-authors J.M. Grimshaw and A.P. Davis - one wonders how such a mention scores in a citation assessment). Even better for the ego is the first Christmas gift the loving and attentive Ben presents to his fiancee Katka: "Katka looked a little disappointed by her first present from me, a signed copy [!] 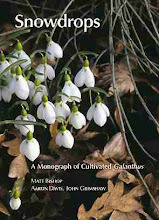 of 'Snowdrops, a Monograph of Cultivated Galanthus', the best book to date on snowdrops, illustrated with close-up photographs that I thought might help her to appreciate the differences between the many named forms." How sweet of him. 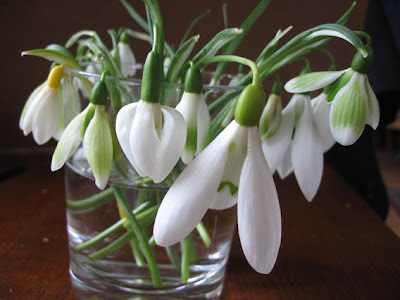 At least we learn later that she has studied it well enough to be familiar with snowdrops in Lady C's collection (she must be more diligent than most of our readers). 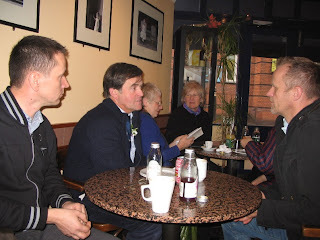 While I can't imagine sales of The Snowdrop Garden will make Martin Baxendale's fortune, it is certain to provide a talking point at snowdrop lunches and gatherings for a year or two. The sensation of the year in the snowdrop community has been the unveiling of Galanthus elwesii 'Anglesey Orange Tip', the richest-coloured of any 'orange' snowdrop to date. 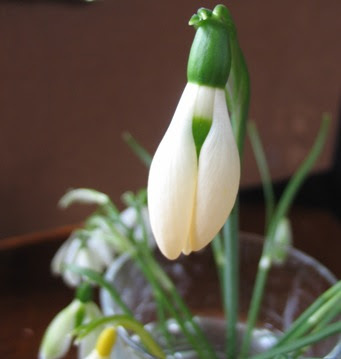 The flower shown here had been open for several days when photographed and unlike the evanescent hint of buff in 'Joy Cozens' (the original 'orange' snowdrop)the colour in 'Anglesey Orange Tip' has not faded in the least. At present the few bulbs of this extraordinary plant are under guard at Anglesey Abbey, Cambridgeshire, where it was discovered and where it has been on display in recent days. The assortment of other highly desirable snowdrops includes, from left to right: the Cambo clone of Sandersii, 'Margaret Biddulph', 'Moses Basket' (another amazing G. elwesii from Anglesey Abbey), 'Angelina', a selection made by Kit Grey-Wilson with enormous flowers, and 'Green Tear' in the top right. Today has been the first day of the year on which the sun has shone brightly and warmly enough for the crocuses to open, despite having dawned to a thin covering of snow. The opening of crocuses is in fact said to be related to a change in temperature rather than the actual temperature achieved, so the modest gain of two or three degrees was actually sufficient to bring the flowers open. As with all the early flowering plants this year the crocuses are running late, so it was the earliest of the commoner spring-flowered species, Crocus sieberi, that was looking at its best today. 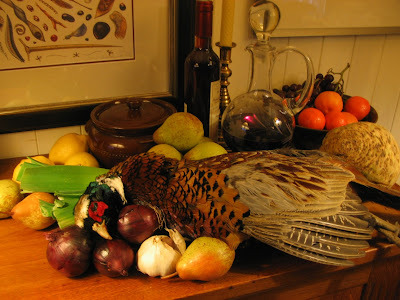 As traditionally understood (i.e. in the sense of Brian Mathew's famous monograph from 1982, The Crocus) Crocus sieberi is a complex of at least four subspecies, of which subsp. sieberi comes from Crete and the others from mainland Greece, although I suspect that this will be challenged in Janis Ruksans' upcoming monograph. The two cultivars looking good today are of horticultural origin, although they show many characters of subsp. atticus (C. atticus), and are of huge garden value. 'Bowles's White', with pure white perianth segments above a rich orange throat, was raised by the Crocus King, E.A. Bowles himself. As he wrote in his Handbook of Crocus and Colchicum (1952) 'In 1923 I found two pure white youngsters among my seedlings, after thirty years of hopeful expectation. The better of these has increased freely and is the best white and orange spring Crocus that I know. It is now known as 'Bowles's White''. He goes on to say that the contrast between 'its pure white perianth with the orange throat and scarlet stigmata' is 'wonderfully fine'. The other cultivar looking good today is 'Firefly', a soft lilac in colour, also with the species' characteristic golden throat. I have not been able to trace its origin, but it was presumably selected for its great flower size, vigour and rapid multiplication. Both look beautiful coming up through short grass - 'Bowles's White' always earlier by some days - and a sure sign of the coming of spring. Visible in the second picture of 'Firefly' are a number of Crocus chrysanthus selections and hybrids, and Galanthus ikariae naturalised on a bank at Colesbourne Park. It used to be that, going up the steps into the New Hall (I know, officially now called the Lawrence Hall, but indelibly in the minds of show regulars it is the New Hall)one was greeted by the sight and scent of the early spring bulbs on the nurserymen's stands. 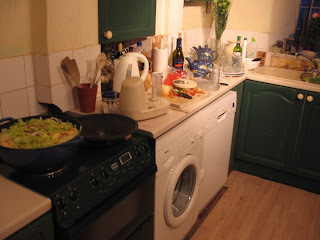 For the past two years, however, we have been confronted by a facade purporting to be a row of houses, around which some mediocre gardens have been 'designed' and flung together. That none of them this year was awarded more than a Silver Medal tells its own story - it is time for this monstrosity to be quietly retired and for the show to be restored to its raison d'etre, the display of plants at the peak of perfection. The great attraction in February is of course snowdrops and there were some lovely displays in the Old Hall, where their scent was as powerful and lovely as ever. 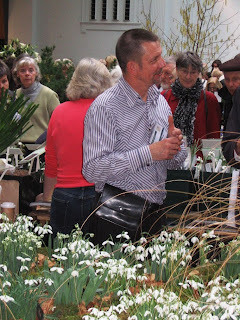 Pride of place was taken by the large circular stand of Avon Bulbs, designed and put together by Alan Street, who won his umpteenth Gold Medal with it - an unsullied display of perfectly grown snowdrops that nobody came close to matching. Not far away was a smaller than usual, but also gold winning stand by Ashwood Nurseries, featuring their cyclamen, hepaticas and hellebores as beautifully as ever. 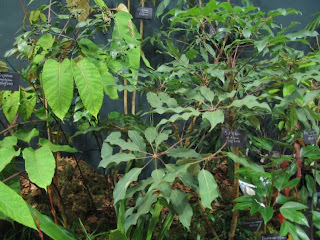 In the New Hall a fascinating stand of all sorts of rare woody plants (plus some herbaceous material) was put up by Bleddyn and Sue Wynn-Jones of Crug Farm Plants, featuring many of their collections of Schefflera and other Araliaceae. They are unparalled as plant collectors in contemporary Britain. The morning was taken up for me by a meeting of the Woody Plant committee which, once the busines was taken care of, was principally a study session on Mahonia led by Roy Lancaster. Material had been brought from arboreta and private collections; Nick Macer and I made a contribution from Gloucestershire. The diversity of sizes and shapes of foliage in this fascinating genus was amazing and we could have spent all day - or more - going through the specimens more thoroughly. 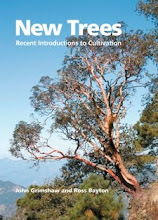 Even so, it was a revelation, and demonstrated the horticultural potential still to be explored in the genus. 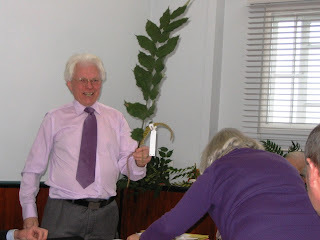 The picture shows Roy brandishing a single leaf of M. mairei. After the long period of cold, grey weather during December and January the snowdrop season is now really getting going. But it is still running late, possibly still as much as a fortnightnbehind what we have come to expect as the norm in recent years. This is evidenced by the fact that some of the early snowdrops are still in excellent condition when in previous years they would have been waning or even over. One of the most conspicuous of these is Galanthus plicatus 'Colossus', one of the flagship snowdrops of Colesbourne Park. 'Colossus' well deserves its name, being one of the largest and most vigorous snowdrops around - the unkind might even call it coarse. In full flower it belies such negation by being proportionate in leaf and flower, but as the flowers fade and the foliage develops to full size (about 30 cm long and 3-4 cm wide)it becomes less than petite. Indeed there is some justification in regarding it as the first foliage plant to emerge in the year. This vigorous growth results in (and proceeds from) a very large bulb that can be up to 5 cm in diameter. Freely offsetting, a clump builds up very quickly - division (when dormant!) is desirable every few years. The flowers are of typical G. plicatus proportions, though larger than average at over 3 cm long. The inner segments have only a simple apical mark, a tidy arrowhead shape. The first are usually open by Christmas - as they were in 2009 - and can be finished by the end of January, though this year most had not opened before the snow came in early January and thus remain in good condition now. This early-flowering makes it a very useful plant, providing a big snowdrop early in the season, long before most have started. Although it was discovered by Carolyn Elwes on the 'Byzantinus Bank' at Colesbourne, in the early 1980s, 'Colossus' appears to be a representative of G. plicatus subsp. plicatus, which grows nearby in some quantity. Both subspecies are remnants of the garden developed by Henry John Elwes and have naturalized successfully over the past hundred years or so. Athough intermediates occur, subsp. plicatus and subsp. byzantinus are generally recognisable. The latter has shorter leaves and a more rounded flower than the long-leaved, droopy-flowered subsp. plicatus, has two distinct markings on the inner segments, and tends to form masses of seedlings rather than dense clumps of clonally reproducing bulbs. I have never seen seed on 'Colossus' and wonder if it is perhaps a triploid clone, which might also explain its increased vigour.